One hundred and sixty-eight. That’s the number of pirate attacks there were in the Gulf of Aden in 2008. That number dropped to just three in 2014, thanks to Operation Atlanta, which was recently extended to the end of 2020. Behind this vast naval operation to secure shipping lanes off the Horn of Africa lies the European Union. The rejection of the European Defence Community Treaty in 1954 by France left a scar for Europeans. Things came to a head in the middle of the 90s. “During the war in the former Yugoslavia, European nations stayed paralyzed while the conflict raged on their doorstep. It took US intervention under a NATO mandate to hasten the end of the war,” states Deschaux-Dutard, who believes the episode was a turning point. In 2002 the Treaty of Nice gave birth to the Common Security and Defence Policy. Since 2009 the bloc has had a High Representative of the EU for Foreign Affairs and Security Policy, a portfolio currently held by Italy’s Federica Mogherini. Integrated European defense is at a more advanced stage that it appears on first glance – Germany and the Netherlands already operate a joint tank battalion for example – and co-operation is set to increase in the coming years. The expansionist policies of Russia’s Vladimir Poutin and the spikey comments coming from the White House has compelled Europe to take matters into its own hands. Shortly after his election, Barack Obama’s successor announced his country would not carry on indefinitely footing the bill for ensuring Europe’s security, calling on European nations to increase their military and financial contributions to NATO. The above pronouncements have quickly given way to concrete action. “So much the better, because an excellent window of opportunity now exists. On defense matters Macron and Merkel, whose countries provide 40% of military spending in the EU, are singing from the same hymn-sheet. We need to capitalize on this because, with the rise of populism in Europe, who knows if there will be the same enthusiasm in the future,” stresses Deschaux-Dutard, who believes that a European army would be a big step forward. 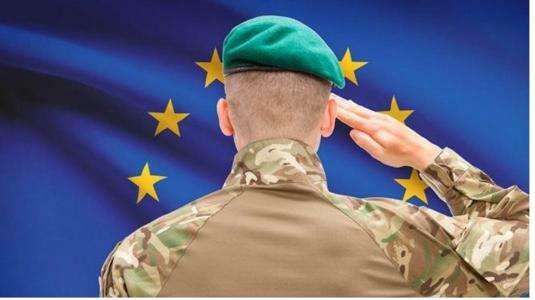 Progress has demonstrably been made, but there is still a long way to go before Europe can boast a fully functioning integrated army. “A common army must have a common ethos,” explains Deschaux-Dutard, “yet each country has its own priorities – for France it’s the Sahel region in Africa, for Germany it’s Eastern Europe. Each country has their own white paper, and on many aspects, they have nothing in common,” adds the analyst. Beyond the issue of harmonizing strategy, there is the question of arms and equipment. Most European countries have revised upwards their military budgets, and the money should not be spent buying in the latest tech from the other side of the pond, according to Macron, “If we have increased our military budgets it’s to build our military autonomy. I don’t want to see European countries increase their military budgets in order to buy American weapons.” This has been the case in many parts of the continent. The modernization of Poland’s armed forces is based on US hardware and a few months ago Belgium choose the US made F-35 over the home-made Eurofighter to replace their current fleet of jet-fighters. Less than half of Europe’s tanks were made on the continent and that figure drops to 20% for artillery. “The establishment of common military-industrial products is a major challenge for the EU,” says Deschaux-Dutard pointing to “the 60 different types of troop transports used by the various European military against twenty for the Americans and the twenty-three different designs that went toward the conception of the NH90 helicopter.” Its clear there are economies of scale to benefit from, if Europeans can avoid working on different versions of the same piece of equipment. Read the full Special Report: The EU: Superpower or Shackled Power?